Head to Mt. Rainier for an unforgettable vacation. fully equipped cabins & vacation rentals, some with hot tubs! full hook-up RV sites, tenting sites & camping cabins. for forest weddings, family reunions & retreats. Looking for a more private vacation? Mounthaven Resort offers 3 beautiful vacation rentals just moments from Mt Rainier. Our fully outfitted vacation homes feature full kitchens, private hot tubs, fireplaces, and more than enough room and privacy for a relaxing vacation. Our vacation rentals can accommodate groups ranging from 2-10 people and several of our properties are pet friendly. 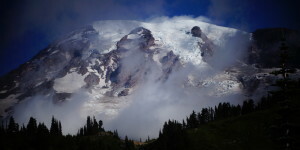 Looking for a more outdoor kind of Mt Rainier Lodging? Located at the perimeter of the resort, our RV spaces are shaded by large cedar trees and back up to a beautiful forest or a mountain creek. Full hookup RV sites have 30 amp electric service, as well as water and sewer connections. All sites are a short distance from laundry and restrooms with showers. Each space also features a picnic table and firepit. Well behaved pets are welcome for an additional charge. Are you dreaming of a rustic forest wedding? Mounthaven Resort offers a large grassy area surrounded by towering trees and bordered by creeks which make for a lovely ceremony venue. 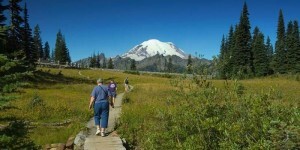 Our Resort near Mount Rainier is also ideal for family reunions and group retreats. 9 cabins and 16 RV sites ensure plenty of Mt. Rainier Lodging for overnight guests. Learn more about hosting your next special event at Mounthaven.